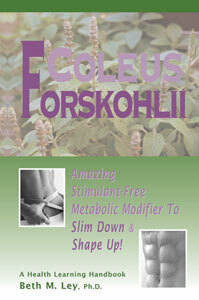 Coleus Forskohlii: Amazing Stimulant-Free Metabolic Modifier to Slim Down and Shape Up! Coleus forskohlii is part of the mint family of plants and has long been used in India, Thailand and parts of SE Asia as a spice as well as an ingredient in various Ayurvedic medicine formulations for the treatment of heart and respiratory ailments and stomach cramps. The roots of the plant are a natural source of forskolin, a unique compound that can increase cellular levels of cyclic Adenosine Mono-Phosphate (cAMP) – believed to influence many aspects of metabolism. Forskolin is known as a metabolic modifier that does not have the negative side effects that thermogenic stimulants do. This natural compound has shown to increase lean body mass and help optimize body composition. Read how supplementing this amazing botanical can help you!